After researching and spending some time with a handful of digital audio recorders a few months back, I decided to buy a Sony PCM-D50. But my second choice would have been a Fostex FR2-LE, and in some areas, the Fostex recorder clearly outshines my trusty D50. 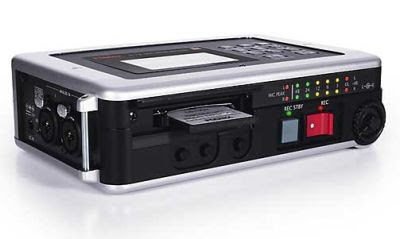 It has XLR inputs, multiple mic inputs, phantom power, a more detailed VU meter, and uses CF cards for memory, which are far more common (and cheaper) than Sony Memory Sticks. On the other hand, it’s bigger than the D50, doesn’t have any internal memory, costs about $100 more, and reportedly has an incredibly difficult to fiddle with battery cover. Barrett Golding at Hearing Voices has been using an FR2-LE for the last few months. And aside from the issue with the battery cover, he seems pretty happy. Click on over to his site for a more detailed review including some audio clips. Overall, it sounds like the FR2-LE sounds great with an external mic, but I wouldn’t recommend using the built-in stereo mics unless you really have to. I’ve got a FR-2LE .. wonderful device! Awesome to record on the road. And the cleanest pre-amps I’ve ever heard on a mobile recorder of this price. I have Both Sony pcm d50 and fostex F2le. They both have clean pre-amps but fostex has XLR inputs so for serious field recording this is the machine to have. Sony with XLR-1 adaptor is superb combination but its at a very high price. Then i would recommend moving onto Korg MR-1000 which is far superior than sony pcm d50. Final Say ; Sony pcm d50 for all round recording. Fostex FR2le for critical recordings – approved by NASA.